Well done to our competition winners! In the Humorous Speech Contest, Jill McGrath won first place and Colin Byford came second. Also competing were Ailbhe Morgan and Tony Bond. All well very crafted and delivered speeches. In The Table Topics Contest, first place went to late entry Rebecca Cramp and second place to Orla Cantwell. Also competing was Colin Byford and Tony Bond. Thanks to all who competed and made it a great night and also thank you to all involved in subsidiary roles and organisation. The Area final will be held on Mon 5th November in Dun Laoghaire at 20:00. Have a good weekend everyone. 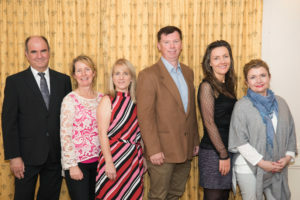 Colin Byford, Jill McGrath, Fiona Morrissey, Mark Sheehan, Rebecca Cramp and Orla Cantwell. PreviousThursday September 27th – Humorous Speech and Table Topics Contest.